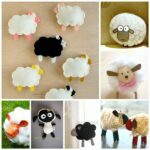 Welcome back to this week’s Kids Crafts – our wooly little lambs. 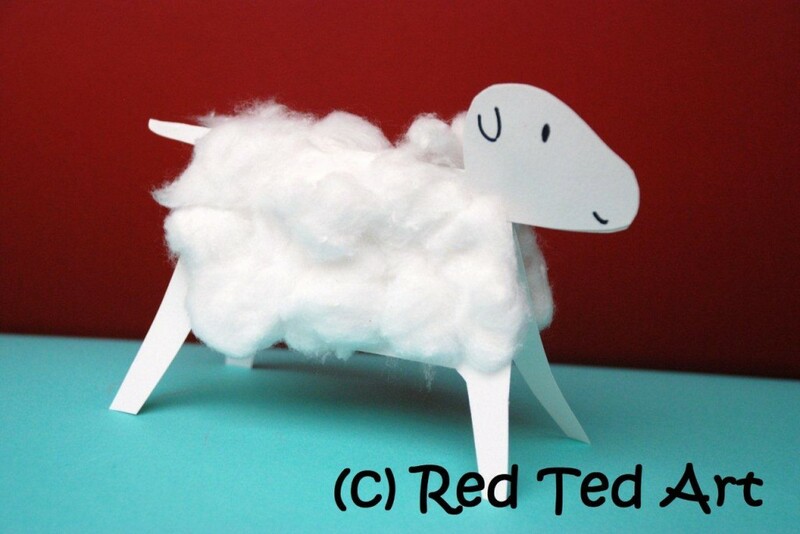 We actually made this lamb craft a year ago for an article in Guardian “Creativity in the Classroom” … and finally it is time to share it here on Red Ted Art too. Hooray. 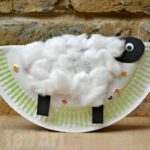 You can make this sheep craft at any time of year, but I do think they are particularly lovely in Spring or for Easter. Another lovely use, is to maybe use it as a mobile for a new baby? 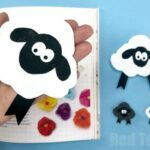 Wouldn’t that be a lovely craft for older siblings to make for a newborn – creating a lamb mobile for their new brother or sister? They are sooo simple, sooo easy and sooo cute! 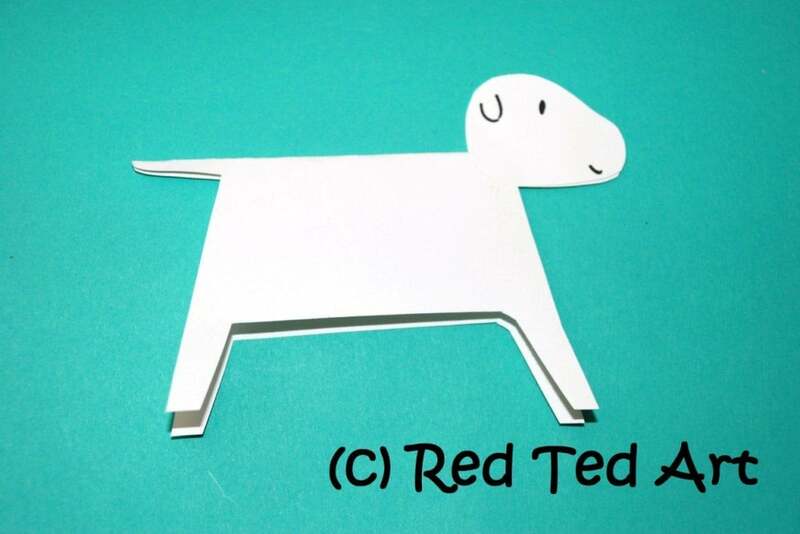 Materials: card – white or coloured, cotton wool, scissors, glue and pen. 1) Fold your card in half and draw a simple outline as above. The fold of the card, will be the ridge of your lamb’s back. Last year, I did all the cutting and Red Ted got to stick on the cotton wool. We made more this year. Red Ted (4) really enjoyed having a go at the cutting. Yes, it was still a challenge, but he did manage one and was sooo proud. He also loved drawing on the eyes and “smiling mouths”. Happy Sheep Craft indeed! 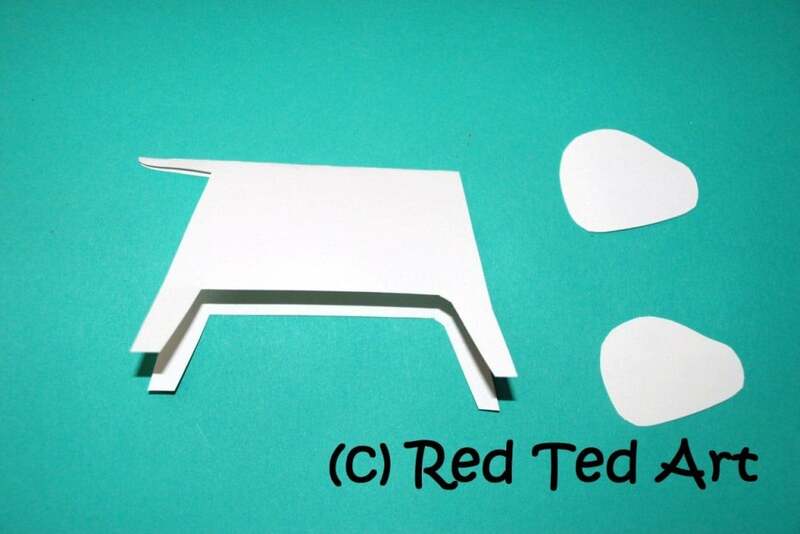 2) I used the card from between the legs to cut out two pieces for the head. Glue the two pieces together, with the bottom left hand corner being inserted over the top right corner of the body. (see picture). 3) Let the kids add all the cotton wool on both sides. This year both kids had fun doing this. Hooray for fluffy sheep! Lovely. Tactile. Fun. 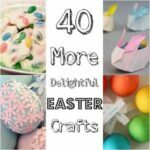 4) Make lots – create a mobile or a garland. 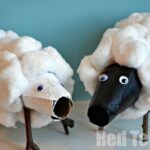 Have fun with your sheep craft! 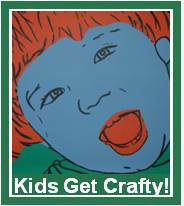 The Kids Get Crafty party is co-hosted by Creative with Kids, bringing you more readers and more ideas to browse! 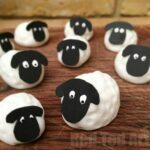 What lamb and sheep crafts have you made? We\’ve put cotton wool on sheep before, but only one-dimensional ones. I love that yours stands up on its own! Oh my it is so adorably cute!! And it is 3D!!! Thank you MaryAnne & Roopa! 🙂 Yes, the fact that they stand up seems to delight the children! So adorable! I like the simplicity of the craft and the fun! Ahhh bless, my three would love making these! Baaa baaa! These are so cute. 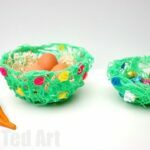 My two girls are going to love making these! Love, love, love. I mean: bah, bah, bah! I have been thinking about how to introduce ‘spring’ this year and Aodhan’s grandparents who are in Manchester were JUST telling him about all the new lambs – so, this is it! Thanks, so much! Thank you for your lovely comments! Hooray for Spring and Easter! Vanesther – thank you so much for the award! How lovely!! I haven’t made any sheepish crafts of late, but I’m inspired! Thanks! 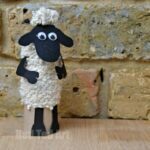 LOVE your little lamb, thanks so much for sharing on Craft Schooling Sunday! Could you please send me a large photo so I can hopefully feature it? All the best! Oooh thank you Sara! And email sent. Oh, these are so adorable. They will go on my easter craft stuff for my niece. Aaaah lovely to have you stop by 🙂 and thank you! Oooh thank you! Will send you an image now! Thanks for hosting the linky off to look for more ideas. Aah how fab! Thank you!! Hope you have lots of fun and find lots of ideas! Hi everyone, love this craft! Wondering what age it would suit best if i were to do the cutting out? I’m bad at knowing the competency of kids but i’d love to try this for my scripture classes! I have to say it totally depends on the child and they probably will vary quite a bit. My son is 4 and was able to JUST about manage… but I still helped him. Would imagine maybe 5-6yrs? And the younger ones need help?